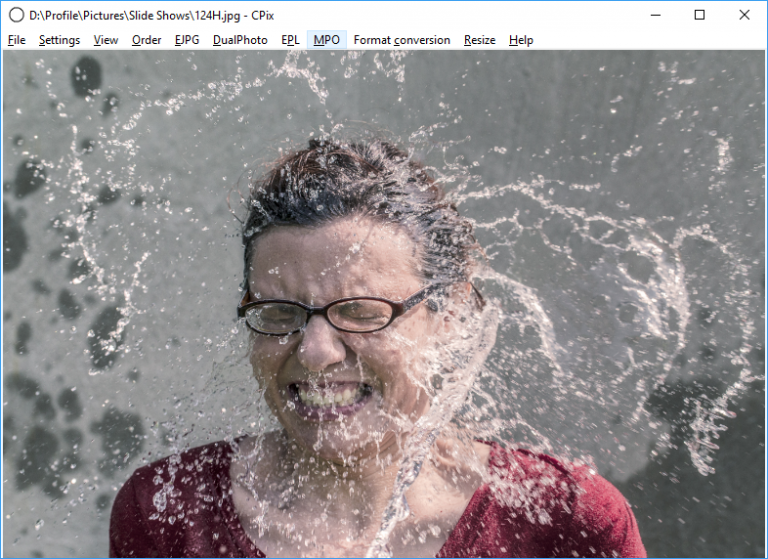 CPix is an unusual image viewer for Windows with a strong focus on multi-picture formats, including MPO, TIFFs and animated GIFs. The interface is basic. There’s no thumbnail browser, just a simple viewing pane where you can drag and drop one or more images and folders. You’re able to navigate through files and folders using standard keyboard commands: right arrow = next, left arrow = previous, page up = next folder, page down = previous folder and so on. What’s a little unusual here is the ability to play multi-page formats like GIFs, TIFFs and MPO files as animations. Playback speed is variable, and you can step through individual frames. Still files and animations may be tweaked with rotates, flips and some simple effects: Negative, Auto Brightness/ Contrast, Warm Color, Cold Color, Grayscale and more. Format conversion tools include options to save all the frames of a multi-picture image, or construct a new multi-frame TIFF from other images. There’s no option to create animated GIFs, but that’s probably not a surprise. The format only supports 256 colors, so finding an optimal palette for someone’s 16-picture HD slideshow would probably take a while, and still leave you with near useless results. What you get instead are some custom file formats of the developer’s own. EJPG is an encrypted version of JPEG; DualPhoto files contain two JPEGs, one encrypted, one not; PL is used to store multiple JPEG photos in one file; EPL is an encrypted version of PL. None of these formats can be used anywhere else, and we’re not sure they have much reason to exist. If you wanted to share a set of JPEGs, why not put them in an encrypted archive and view that? On the plus side, using this kind of quirky approach to encryption does have some security-by-obscurity advantages, and if you’re looking to hide images it might be interesting. It also shows the developer has more ambition than most, especially as this is only CPix 1.0 -- what might he do next? CPix is a free application for Windows.